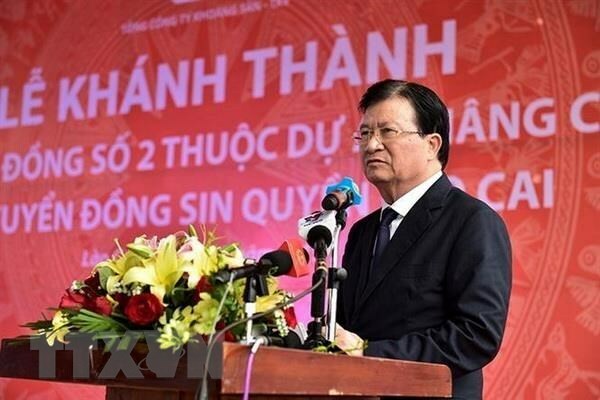 Lao Cai (VNA) – Deputy Prime Minister Trinh Dinh Dung on March 27 stressed the need for effective management and exploitation of minerals for sustainably developing the economy while ensuring national defence and security and protecting the environment. He made the remarks while attending the inauguration ceremony for the Vietnam National Coal-Mineral Industries Holding Corporation Limited (Vinacomin)’s copper plant No.2 at Sin Quyen copper complex in the northern province of Lao Cai. Dung said that the plant’s operation is a significant move to improve the efficiency of Sin Quyen copper mine, helping ensure sufficient materials for domestic consumption and export. The plant, invested with more than 2.56 trillion VND (110.1 million USD), is part of the project to improve the capacity of Sin Quyen copper complex. With a designed capacity of 44,200 tonnes of copper ore each year, the plant is expected to supply enough materials for local refining companies. Since its commercial operation in January this year, the plant has mined nearly 3,400 tonnes of copper ore.
As Lao Cai has abundant mineral and natural resources, Deputy PM Dung asked the province to continue support for mineral projects in the locality, especially in the compensation, land clearance and resettlement work. Besides, it should join hands with competent agencies to map local mineral reserves, and zone off areas having prospects for natural resources development, he said. As for Vinacomin, Dung hailed the corporation’s efforts in overcoming challenges to develop production and business as well as ensure national power security. He ordered the group to accelerate its projects, particularly the Lao Cai copper refining plant, so that the total copper refining capacity can reach 30,000 tonnes after 2020.